A queen eats the heart of a sea monster in order to magically bear a child. A vain king’s attempts to seduce a beautiful young woman are manipulated by a pair of elderly sisters. A father’s obsession with an enormous flea brings his own daughter to ruin. These three fairy tales, all originally adapted by 17th century Italian courtier Giambattista Basile, form the basis for Tale of Tales: a dark fantasy feature by director Matteo Garrone (Gomorrah). Fairy tales have formed the basis for fantasy cinema throughout the history of the film medium, with varying degrees of success. To his credit Garrone nails the dark, macabre tone of the early fairy tales, with a film that is regularly unsettling and knowingly bleak, and which combines moments of gothic horror with an absurd and knowing wit. He also cleverly shoots the film in and around genuine medieval castles across Italy, all of which are sumptuously shot by cinematographer Peter Suschitzky. 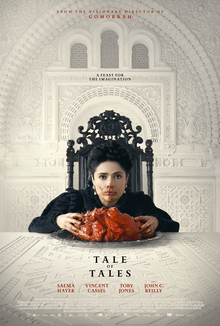 The costumes and production design are equally enticing, transforming Tale of Tales into an impressive feast for the eyes. The first story sees a king (John C. Reilly) and queen (Salma Hayek) crave a child so desperately that they consult a necromancer (Franco Pistoni) to achieve their dream via supernatural means. He has the king defeat a sea monster – dying in the process – before having a virgin cook the beast’s heart, and the queen to eat that heart until there is no more. Both the queen and the virgin fall pregnant, and sixteen years later she struggles to separate the twin boys when they finally meet. It feels a slightly muddled storyline, particularly in its final act which is understated enough to be very slightly confusing. Reilly’s role is frustratingly brief, although Hayek delivers a strong performance throughout. By comparison the second storyline feels oddly undercooked. Vincent Cassel plays a laviscious king who spies a singing girl in the distance and dedicates himself to wooing her. He does not realise that she is actually an old woman, and when he arrives to woo her she tricks him into still believing her to be young. There is plenty that happens beyond that point, including magic, a wedding, and easily the film’s most graphic horror sequence, but it all feels oddly trunctated and left on the table. It feels like the potential of a story, rather than a fully-fledged tale in its own right. The third sequence sees yet another king (the always engaging Toby Jones) abandoning his daughter after growing obsessed with a flea. When the flea grows to the size of a cow he becomes even more obsessed, bringing both his daughter’s life and his own to ruin. Of the three, this third storyline feels like the most accomplished and satisfying. Part of that comes down to the clarity of its ending: this is the only storyline to actually come to a definitive and clear conclusion, with the other two remaining remarkably vague and abrupt. Sadly, and despite both beautiful imagery and some exceptional scenes, Tale of Tales collapses in the editing. At 133 minutes it is easily more than half an hour too long, with numerous extraneous or meandering scenes dragging the pace to an apparent standstill. Garrone also makes the mistake of swapping back and forth between the three stories as the film goes on. There is no real need to do so – they do not share characters between them, or interrelate in any significant fashion – and the constant jumping back and forth simply renders the film a little confusing. A tighter edit, and an anthology structure where each story plays out separately and in turn, would have resulted in a much stronger production altogether. There is worth in Tale of Tales, but it is ultimately a hugely frustrating experience. A great film is buried inside what plays out on the screen, but unfortunately in this case its director failed to nail it down.